There is a lot more to running a successful restaurant than serving good food. Just about any restaurant can do this. If you want your customers to come back time and time again, you need to explore a few unique options to make their dining experience great. People remember the little things that show them that you care. Gimmicks aren’t the answer, but doing things like offering birthday parties complete with cake, singing wait staff, and special menus are a great start. And if you really want to set your restaurant apart from the rest, adding cake sparklers to your birthday cakes is a great way to make your customers’ birthday celebrations memorable. What are Birthday Cake Sparklers? Cake sparklers are a little different than standard wedding sparklers. Instead of being made from a single length of coated steel wire, our birthday cake sparklers measure six-inches long by 1/2-inch in diameter and come with a stake to attach them to the cake. Once you light them, these sparklers will burn for approximately 50 seconds. They burn with a golden flame that rises 12 to 16 inches from the top of the tube. The best part is that our cake sparklers are virtually smoke-free, making them the perfect choice for use in your restaurant. They are perfectly safe for use on cakes and many other foods. Your customers come to your establishment hoping for a great experience. Whether the event is for an adult or a child, serving up a boring cake is unforgivable and a great way to ensure this group finds somewhere else for their next party. It is up to you and your staff to come up with a new and unique way to help make their celebration one to remember. To make this happen, you need to step out of the box and ditch those boring old candles. Replace them with birthday cake sparklers and you are sure to delight the entire party. 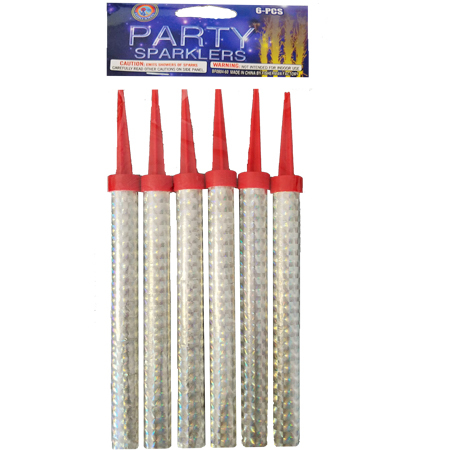 Because we offer our cake sparklers in bulk packs of 300, you can light up the party for less than a buck a sparkler. While regular straight sparklers may be the perfect solution for most adults, kids need something a bit more exciting. For those that need more, we offer sets of number sparklers going from 0 to 9, making it possible for you to put any age on a cake. Perfect for anyone who happens to be celebrating their 29th birthday for the 3rd or 4th time! You can use the number sparklers alone or you can use them along with several of our birthday cake sparklers to create a spectacular display of golden sparks. Let the imagination of your pastry chef run wild and let him create stunning displays of golden sparks that are totally harmless. To see our entire selection of cake sparklers, visit Wedding Sparklers Outlet online and see how you can make your customers’ birthday celebrations something they will never forget. What a great way to boost your business for such a small investment!